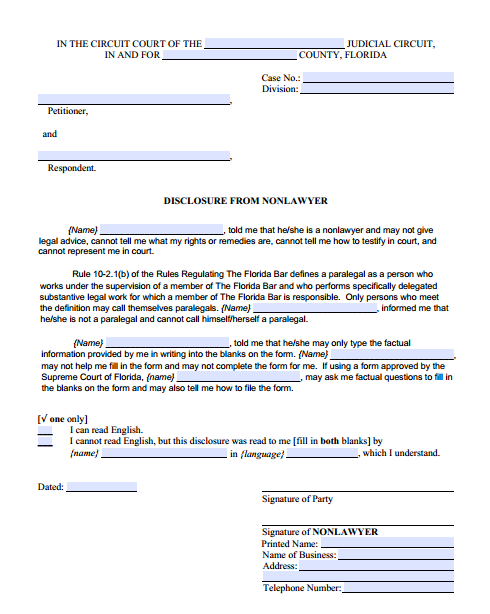 PDF Fillable Form 12.900(a) Disclosure From Nonlawyer. This form must be used when anyone who is not a lawyer in good standing with The Florida Bar helps you complete any Florida Family Law Form. Attorneys who are licensed to practice in other states but not Florida, or who have been disbarred or suspended from the practice of law in Florida, are nonlawyers for the purposes of the Florida Family Law Forms and instructions. The nonlawyer must complete this form and both of you are to sign it before the nonlawyer assists you in completing any Family Law Form.